“In the event that Republicans make good on their threat by failing to act, or by moving unilaterally to pass a debt-limit extension only as part of unbalanced or unreasonable legislation, we believe you must be willing to take any lawful steps to ensure that America does not break its promises and trigger a global economic crisis — without Congressional approval, if necessary,” wrote Senators Harry Reid of Nevada, Richard J. Durbin of Illinois, Charles E. Schumer of New York and Patty Murray of Washington. Democratic leadership aides said the Senate would probably take up legislation in early February that would allow the president to raise the debt ceiling on his own in set increments, perhaps of $1 trillion. Congress would have the ability to reject the increase, but that would take a two-thirds majority. That plan was first used at the suggestion of Senator McConnell in 2011 to solve the last debt-ceiling impasse. I remain confident that the debt ceiling will be raised, and that the US Government will pay the bills. However “fear” will start slowing the economy soon – just like in 2011 – and the House will receive (and deserves) all of the blame for any damage done to the economy. I assume the House is looking for a way out, and maybe another McConnell bill is the solution. 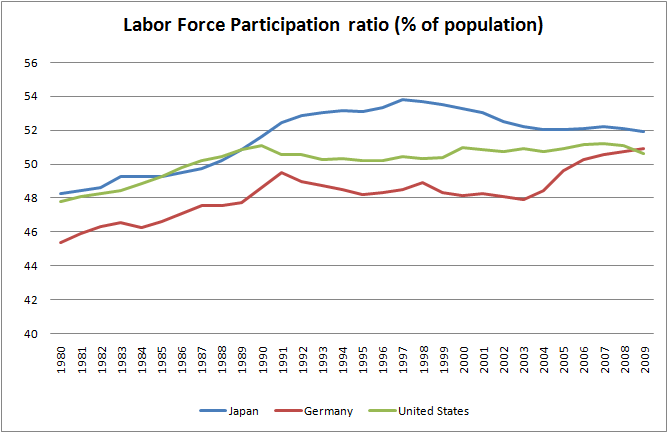 The myth of Japan’s "lost decade"? From Urbaneconomics comes this. The take away is that Japan’s economic performance is not as bad as represented when per working age productivity is examined, but an aging population slowed aggregate growth. The issue of aging population will be one for most industrialized nations. One additional thing to consider is what does this say for the success of Japan’s stimulus programs. These programs have generally been dismissed as not very successful, but that may be an unwarranted assumption. Daniel Gros provides an interesting twist to the conventional wisdom that Japan suffered a "lost decade" in the first decade of the millennium, posting annualized real GDP growth of just 0.6% (to US’s 1.7%) – demography! "When one looks at GDP/WAP (defined as population aged 20-60), one gets a surprising result: Japan has actually done better than the US or most European countries over the last decade. The reason is simple: Japan’s overall growth rates have been quite low, but growth was achieved despite a rapidly shrinking working-age population. The difference between Japan and the US is instructive here: in terms of overall GDP growth, it was about one percentage point, but larger in terms of the annual WAP growth rates – more than 1.5 percentage points, given that the US working-age population grew by 0.8%, whereas Japan’s has been shrinking at about the same rate. Another indication that Japan has fully used its potential is that the unemployment rate has been constant over the last decade. By contrast, the US unemployment rate has almost doubled, now approaching 10%. One might thus conclude that the US should take Japan as an example not of stagnation, but of how to squeeze maximum growth from limited potential." 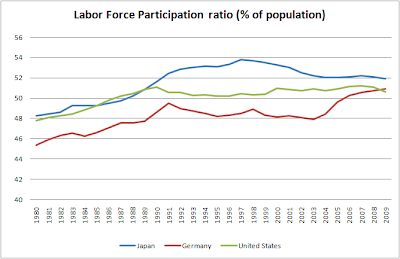 Assuming the working population as the measure of the country’s productive capacity, it can be safely concluded that Japan has been successful in squeezing out the most from its shrinking working population. Since its working age population will continue to shrink by about 1% per year, Japan’s continued relative decline is to be expected. Germany and Italy too are likely to follow in Japan’s footsteps. Prof Gros attributes the current strength of the German economy partly due to the temporary demographic stabilization in the 2005-15 period. "Slow growth in Japan over the last decade was due not to insufficiently aggressive macroeconomic policies, but to an unfavorable demographic trend. Second, a further slowdown in rich countries’ growth rates appears inevitable, given that even in the more dynamic countries the growth rates of the working-age population is declining. In the less dynamic ones, like Japan, Germany, and Italy, near-stagnation seems inevitable." Now for a different perspective. But I think you can still question the Obama as the mega spender theme. Keith Hennesy, who worked forPresident Bush see spending in much more dire terms the my previous post. I think this is partially that he is looking at a little longer time frame. The long-run growth in entitlements certainly looks unsustainable here. Also, I think his short-run graphs are influenced by the current recession to make Obama look bad. Another point in common with the post below linked to Krugman is that the issue isn’t new entitlements. It’s current programs. in any case read Hennnesy for a different perspective. The exact slope of that white spending line depends on a lot of assumptions, and there are esoteric debates about those assumptions. Some analysts would have it reach about 36% by 2080, and others in the mid 40’s. Those are huge differences, but everyone’s line ends up looking similar, and the basic conclusion remains unchanged – the long-term spending line slopes up dramatically. The tax lines remain basically flat, as they have since the end of World War II. The difference between these slopes creates an unsustainable borrowing trend that, if left unchecked, would eventually cause the U.S. economy to collapse. America’s long run fiscal problem is spending growth, not taxes | KeithHennessey.com. I think that this may be a little to easy on the administration. Still when you think of the widely asserted spending explosion, how many major new social programs can you really think of? …The Obama stimulus didn’t contain a lot of public works — and those works, such as they are, have only partially come on line. Meanwhile, aid to state and local governments wasn’t enough to prevent substantial cuts. So by this measure, government spending has gone nowhere. The bottom line is that notions of a vastly expanding [SIC] government are highly overblown. This post is very insightful coming from a deficit hawk who understands why that doesn’t any sense in the 2-4 years. We need ultimately to get our house in order, but not by making the recession deeper. Last night I read a post by Brad DeLong that made me so mad I had trouble falling asleep. (Not at DeLong, mind you.) There’s really nothing unusual in there — hysteria about the deficit, people who voted for the Bush tax cuts and the unfunded Medicare prescription drug benefit but suddenly think the national debt is killing us, political pandering — but maybe it was the proverbial straw. People who insist that the recent change in our fiscal spending is the product of high spending, without looking at the numbers, because their political priors are so strong they assume that high deficits under a Democratic president must be due to runaway spending. And it’s not just Robert Samuelson. PEOPLE WHO BUY THIS OBAMA THE BIG DEFICIT SPENDING DEMOCRAT HAVE NO CONCEPT THAT MUCH OF THE INCREASE IN THE DEFICIT THIS YEAR IS REDUCED REVENUES. I DON’T THINK THEY EVEN THINK ABOUT THIS. People who forecast the end of the world without pointing out why the world is ending. Here’s Niall Ferguson, in an article entitled “An Empire at Risk:” “The deficit for the fiscal year 2009 came in at more than $1.4 trillion—about 11.2 percent of GDP, according to the Congressional Budget Office (CBO). That’s a bigger deficit than any seen in the past 60 years—only slightly larger in relative terms than the deficit in 1942.” But does he mention that the reason for the 2009 deficit is lower tax revenues due to the financial crisis and recession? No. Here’s Ferguson on the 10-year projection: “Meanwhile, in dollar terms, the total debt held by the public (excluding government agencies, but including foreigners) rises from $5.8 trillion in 2008 to $14.3 trillion in 2019—from 41 percent of GDP to 68 percent.” Does he mention that, as early as January 2008, that number was projected to fall to 22%, and the majority of the change is due to lower tax revenues? No. People who posture about our fiscal crisis who voted for the Bush tax cuts — shouldn’t shame require them to keep silent? DURING THIS PERIOD WE ALSO PASSED A DRUG ENTITLEMENT WITH NO MATCHING REVENUES, AND THE GOP SEEMS TO WANT TO PROTECT MEDICARE. ALL OF TODAY’S “CONSERVATIVES” ASSUME I THINK THAT THE DEFICIT IS SOMEHOW DUE TO TRANSFERS TO PEOPLE LESS WELL OFF THAN THEY. FURTHERMORE I DON’T THINK MOST CONSERVATIVES ARE UP FOR ANY PERSONAL SACRIFICE TO CURE THE DEFICIT. People who say that we can’t pass health care reform because it costs too much, ignoring the fact that the CBO projects the bills to be roughly deficit neutral, ignoring the fact that the Senate bill has received bipartisan health-economist support for its cost-cutting measures, and ignoring the fact that our long-term fiscal problem is, and always has been, about health care costs (see Figure 2). THIS CONCERN I SHARE BECAUSE I THINK THE BACKERS OF THE REFORM MAY NEVER DELIVER THE CUTS INTENDED TO PARTIALLY PAY FOR IT. IF I COULD BE REASSURED ON THIS POINT I’D AGREE. People who say the Obama administration is weak on the deficit (Ferguson refers to Obama’s “indecision on the deficit”, and he is gentle by Republican standards), when by tackling health care costs head-on — and in the process angering their political base — they are doing the absolute most important thing necessary to solve the long-term debt problem. ALMOST CERTAINLY TRUE. YOU USE THE DEFICIT TO DEFEAT LARGESS THAT YOU DON’T GET A PIECE OF.